This will be my first attempt at draw boring pegged tenons in a breadboard end on a maple table. In videos I have seen one expert draw 1/32” and another draw 1/16”. I assume different woods can handle different draw measurements – what would you recommend for maple? I would like to use square pegs for the appearance but wonder how that will affect the strength of the wood; either in the peg or in the tenon? Gerald, I usually offset by 1/16” for all species of wood. As to your square pegs … see post #33 on the thread Hand Tool Woodworking Jigs & Fixtures. the pegs should only be square for about 1/8” on the show end … you will whittle them to fit the bored holes. Thanks for the advice Ron, I enjoyed the whole thread you referenced and feel much more comfortable with the peg project. I’m glad it was a help. Are you by chance going to tackle your upcoming project unplugged? No, I have power tools and enjoy using them :) Making square headed round pegs is a good job for my lathe. I am just getting back into finer woodworking after a 9 year hiatus during which my tools of choice were chainsaws and sledge hammers. Looking at the age of my power tools – I may consider replacing them with the unplugged variety where feasible. ... Making square headed round pegs is a good job for my lathe. WOW … what are you making? When you first mentioned drawbore pins I was thing 3/16” to a 1/4” maximum. Or do you have a really tiny lathe? LOL! Turned pegs. One way or that other one, make sure the grain of the pegs is continuous. 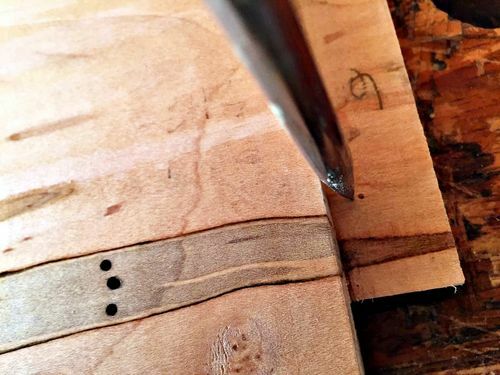 In driving tight fitting pegs through the off-set holes there is some tremendous force involved in order to draw the connecting pieces together and hold them under tension. Difficult enough with pegs of full strength and good form but where is run-out along their lengths you can expect shearing and that’s most unwelcome. Well, this is the rationale for riven pegs, it ensures continuous grain over the whole peg length. I also rive my pegs. I use a dowel plate they don’t come out looking pretty but they are strong.I use the any curve to my advantage to snake around the off set. 1/16 is too much must be some soft maple. I will keep a sharp eye on the grain and maybe offset 1/32 only. I am thinking 3/8 peg with 1/2 by 1/2 square head. There would be 6 of them across a 44” breadboarded table end. Walnut pegs in maple table. Will that size take too much away from the maple?